Secret? Oh, come on, the National Enquirer must be joking, or not talking to the right people. The plot to kill Obama is part of the Barack Obama Death Cult, and it’s gathering momentum. The Enquirer says that when Obama’s jet was forced to make an unscheduled landing, “emergency crews were standing by”. Wow, indeed. “This could have been a skilfully planned assassination attempt,” says another “source”. What it was was an emergency safety slide that inflated in the tail cone of Obama’s flight form Chicago to Carlotte shortly after take off. The Enquirer says the chute “affected sensitive control equipment such as cables, pulleys and levers” – the apogee of high-tech gadgets and gizmos. 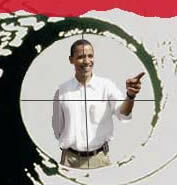 Happily, Obama was not killed, and so lives to be killed another day (surely President? – Ed).